An artist I met at Atelier Lacourière Frélaut, Hugo Besard, introduced me to Rudolf Broulim, a master printmaker who had left his native Prague and settled near Antwerp. Rudolf has worked with many artists (including Jiří Anderle and Oldřich Kulhánek), producing stunning artworks, delicate in execution and powerful in content, and beautifully printed. When I was able to schedule a residency to work with Rudolf, he had relocated his atelier to the nearby town of Zwijndrecht. This space was larger than the first atelier of his that I had seen, with more light, and very well organized for both lithography and intaglio printmaking. In making art I always attempt to do something I haven’t done before, to make each experience new and challenging, and when an opportunity to work with someone occurs, I hope to learn from the process and expand my personal experience/vocabulary. I had gone to Paris to work with Hayter at Atelier 17, in part to learn from the source, about simultaneous color printmaking; my initial experiences at Atelier Lacourière Frélaut were inspired by Picasso’s aquatints. With Rudolf, I would have been happy to work in whichever medium he offered, because his work is at the highest level, a true master. Reflecting on it after visiting his new space, I kept looking at his supply of stones, and thinking about the history of lithography, and how in my own development it had played such an important role. Making some lithographs with him was going to be exciting, and an honor. I only had a few days to work in the atelier so decided on a plan of action – three images drawn on stone, one printed on the off-set press so it would appear “as drawn,” while the other two would be printed directly from stone. Without knowing for certain how many layers would be needed, I knew there would be at least one transparent layer over each of the key images. We prepared two stones for the asphaltum method, a way of drawing an image into a dark ground, a beautiful way to render chiaroscuro. Notched was the first stone, covered edge to edge, with the unique shape of that stone and it’s history, embedded and printed as part of the image. The hand-wrought image was based on a series of notched paintings I had been working on which questioned illusion and emphasized the three-dimensionality of the painting as object. Simultaneously with the series of notched paintings, I was exploring implied space and illusory depth in the Enclosure Series; the other two prints I made with Rudolf, Antwerp Morning and Antwerp Night, continue those explorations. The lower panel(s) in this series, reserved for marks, drips, splashes, scrapings, etc., become a record of the history of the making of each work. 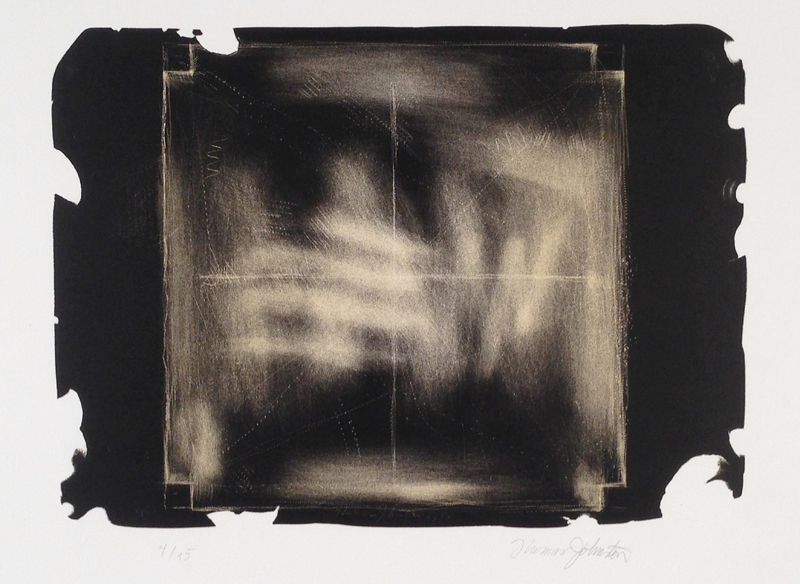 Both lithographs deal with light and dark, addition and subtraction as part of the process and image. They make use of two different approaches in lithography: in one, dark, dense fields with light emanating from within, light subtracted from dark; and in the other, building up with delicate washes of liquid tusche and multiple transparent layers of color. Working directly with Rudolf was a rich and rewarding experience; he was there to offer his experience, and suggest process as he observed an image evolving; but his suggestions were never made to influence or direct an aesthetic decision. Like his atelier, he is well organized, full of light and openness, so the visiting artist can breathe and have the comfort to move around. These three lithographs are included in the Works on Paper section of the Portfolios of this site. West coast based artist, Thomas Johnston, is a painter, printmaker, photographer. His artworks are found in private and public collections internationally. He has had residencies and worked independently in the U.S., Mexico, Canada, France, Belgium, Italy, and England. His studio is located in the South Sound region of the Pacific Northwest near Olympia, Washington.